Yanomami, Spirit of the Forest brought international artists into contact with the shamans of Watoriki (Windy Mountain), a Yanomami village in the Brazilian Amazon. The ambition of this exhibition [may-october, 2003] was not to lapse into exoticism or paternalism, but to connect our conception of images and representations with that of another culture, exploring how the traditional yet constantly evolving metaphysical world of the Yanomami echoes the various facets of the 'savage mind' still at work in our society. This exchange was organized in collaboration with the shamans of Watoriki and Davi Kopenawa, their spokesman. Consequently, Yanomami, Spirit of the Forest features neither tribal feather ornaments, nor any 'Amerindian' or 'crossover' art. Nor is this an ethnological or humanitarian exhibition. Treating Yanomami thought on an equal footing, this exhibition's films, photographs, paintings, sculptures and video installations offer a web of correspondences relating to the major themes of the cosmological ideas and visionary experience of the eleven shamans of the village of Watoriki. The exhibition features work by Claudia Andujar, Lothar Baumgarten, Vincent Beaurin, Raymond Depardon, Gary Hill, Tony Oursler, Wolfgang Staehle, Naoki Takizawa, Adriana Varejão , Stephen Vitiello, Geraldo Yanomami, Joseca Yanomami and Volkmar Ziegler. The exhibition is organized by the Fondation Cartier with the participation of the Yanomami of Watoriki village, Brazil, in collaboration with Survival International, the Brazilian NGO CCPY and anthropologist Bruce Albert. >from *Yanomami, Spirit of the Forest exhibition site*. October 15-16, 2003. > survival international for tribal peoples. Survival is a worldwide organisation supporting tribal peoples. It stands for their right to decide their own future and helps them protect their lives, lands and human rights. 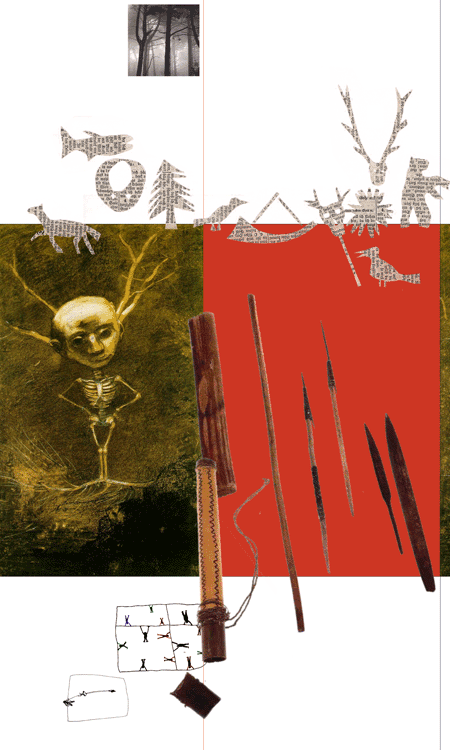 > the shamantic web: art and mind in emergence by roy ascott.